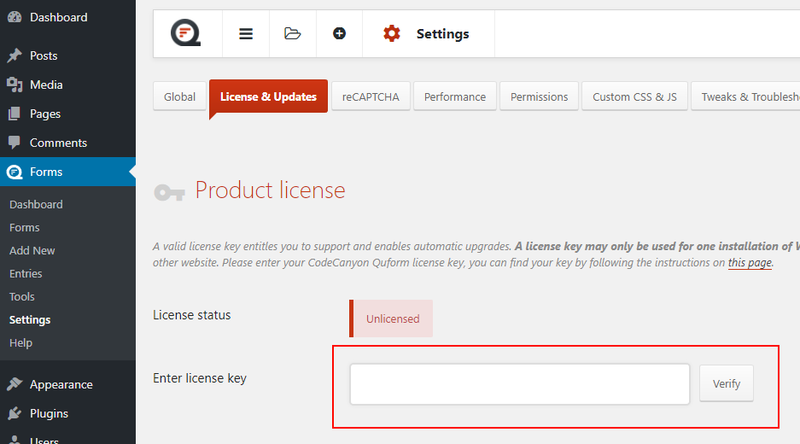 To activate the plugin license you will need your CodeCanyon purchase code for Quform. You can find it by visiting this link, make sure you are logged in to CodeCanyon and you should see the purchase code at the bottom of the page content, see the example below. Copy the purchase code then, in WordPress, go to the Forms → Settings page, then go to the License & Updates tab and paste the purchase code into the Enter license key field, then click Verify.